At age twenty-one, Lewis bought merchandise and sailed for New York as a mercantile agent – one who is authorized by a principal to buy or sell goods, and/or to acquire a loan by using the principal’s goods as collateral. Francis Lewis married Elizabeth Annesley, his business partner’s younger sister, on June 15, 1745. The couple would have seven children, but only three survived infancy. Lewis engaged extensively with foreign commerce, and traveled widely in Europe. 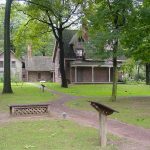 About 1765, he moved his family to Long Island, where he acquired a 200-acre estate at Whitestone. He retired from business, but returned to New York in 177I for the purpose of establishing his son, Francis Lewis, Jr., in business. Lewis moved his family back to Long Island in 1775, and there Elizabeth resided permanently, though her husband and sons were away a large portion of the time. The issue of taxation without representation turned Lewis’ loyalties from the Crown to the Revolutionary movement, and he became known as one of New York City’s leading radicals. The Committee of Fifty, which was formed in New York in 1774 to protest the closing of the port of Boston, became the Committee of Fifty-One when Lewis became the fifty-first member on May 16. Because of British encroachment on human rights, Lewis became alarmed and sprang into action. He joined the Sons of Liberty – a secret society formed to protest the Stamp Act – as a fellowship to work against undue power exercised by the mother country, and became active in politics. Francis Lewis devoted his attention entirely to public affairs after his election to the First Continental Congress in 1775, and became one of the signers of the Declaration of Independence in 1776. 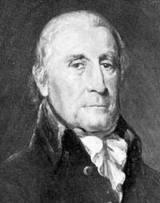 He was a delegate to the Continental Congress from 1776 to 1779. To further the cause of freedom, he spent a large portion of the fortune he had earned from his business to purchase provisions and clothing for the Continental Army, and would end the war virtually penniless. Elizabeth Lewis was as imposing a figure as her husband in the American Revolution. She was endowed with unusual intelligence, and actively conducted the education of her children. At her home, whether in New York or at Whitestone, Long Island, she was a favorite with the leaders of the early Republic. She was fiercely patriotic, and willingly faced death for the sake of her convictions. Like the other New York signers, Francis Lewis was condemned by the British authorities, and a price was put on his head. They thirsted for revenge upon a man who had dared to affix his signature to a document that proclaimed the independence of America. 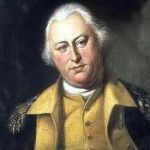 In the autumn of 1776, the British occupied Long Island, and troops were sent “to seize the lady and destroy the property.” Lewis probably would have been hanged if he had been there. As the soldiers advanced on one side, a ship of war from the other fired upon the house. Elizabeth Lewis looked calmly on. A shot from the vessel struck the board on which she stood. One of her servants cried: “Run, Mistress, run.” Elizabeth replied: “Another shot is not likely to strike the same spot,” and did not move. The soldiers entered the house and began to plunder and destroy their belongings. One of them threw himself at her feet and tore the buckles from her shoes, which looked like gold but were not. “All is not gold that glitters,” she remarked. The soldiers destroyed their country home – books, papers, pictures and furniture – and arrested Elizabeth, who was in her late fifties and already in poor health, and took her to prison in New York City. For some time, she was not allowed a bed or any extra clothing, and only the coarse and scanty food that was doled out each day to the prisoners. For weeks this continued during which time she was not permitted to communicate with anyone outside. Then a black man, an old family servant, who had followed her to the city, managed to find out where she was and to smuggle some small articles of clothing and some food in to her, and also carried letters through the lines to her friends. The matter was taken up by Congress and referred to the Board of War, and demands made upon the British for her better treatment. The British were bent on making an example of her because of her wealth and prominence, and the poor woman found little relief. Held in a damp, unheated, filthy prison, Elizabeth Annesley Lewis became very ill. Finally, after nearly three months, the matter was brought to the attention of General George Washington, who ordered the arrest of Mrs. Barren, wife of the British Paymaster General, and Mrs. Kempe, wife of the Attorney General of Pennsylvania, at their homes in Philadelphia. 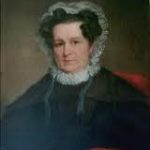 The women were confined to their own homes, under guard, and the intimation carried to the British authorities that unless an exchange was arranged immediately, they would be subjected to the same treatment as was being received by Mrs. Lewis. The exchange was made, but Elizabeth was not permitted to leave New York City. Hardly had Elizabeth taken a deep breath when the aged black servant who had remained with her, doing what little he could to help, fell ill. He was a Roman Catholic, and would not die without last rites. There was not a priest in New York because the city was under martial law. Elizabeth sent a messenger to Philadelphia, who found a priest and smuggled him through the British lines just in time to administer last rites to the dying man, who passed away in peace. Elizabeth Lewis never recovered from the inhuman treatment she had received at the hands of the British. Her suffering and privation were too much even for a strong constitution. After some months, she was allowed to join her husband in Philadelphia. It was plain to see, however, that her health was failing. Early in 1779, Francis Lewis asked for a leave of absence from the Continental Congress in order to care for his wife. Mrs. Lewis had more than one opportunity of showing the steady purpose, the firmness of nerve that would have distinguished her had she been a man… To Francis Lewis, she was Heaven’s best gift. When his adventurous spirit led him to embark on long and perilous voyages, he knew that he left his children to the care of an able as well as a tender mother, who could train their characters as well as protect their interests. The conduct and careers of her children is the best eulogy of Mrs. Francis Lewis. Elizabeth Lewis was driven to an untimely death by the hardships she was forced to undergo from the British, because her husband was a signer of the Declaration of Independence. She contracted a fever which developed into lingering consumption, and died within two years of being released from prison. She lived to see her children married, but not to see her country liberated from British rule. Francis Lewis retired from Congress in 1781, and his last years were confined to frugal and modest living with his two sons; most of his independent fortune was given to his countrymen for the cause of independence. His old age was happy and cheerful, and he enjoyed the society of his children and grandchildren. He also served as a vestryman for the Trinity Church in New York City. Francis Lewis died at age 89 on December, 31 1802, at New York City. He left only $15,000 – not poverty-stricken, but a long fall from the wealthy merchant of pre-Revolution days. He was buried in the yard of Trinity Church.